Dazzle your loved ones with this luxurious meringue-based French pastry. It’s simply ethereal. You’d pay a fortune for this at a bakery, but it’s easy and exceptionally frugal to make yourself. (Patti Diamond) Strawberries and Cream Daquoise looks like an expensive dessert but, with just a few ingredients, is easy to make and budget friendly. Traditionally, dacquoise (dakwaz) is defined as nut meringue. 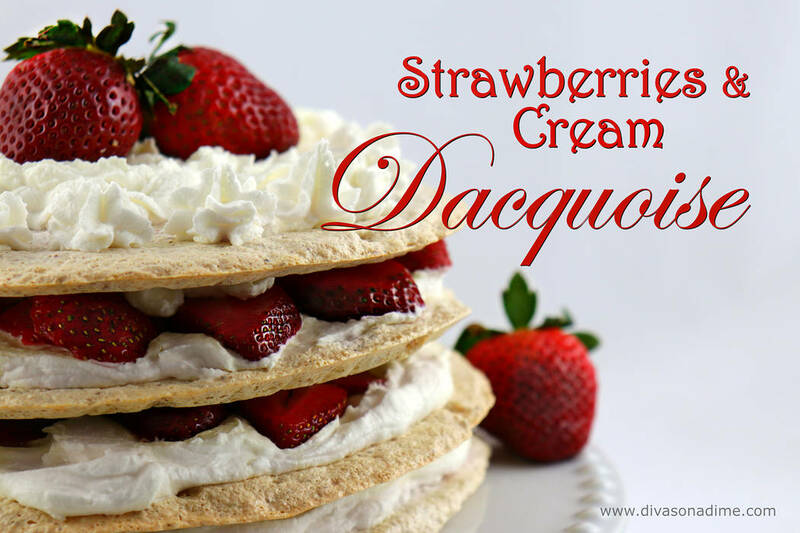 Made from egg whites whipped into billowy clouds, dacquoise can be used as the base for many desserts. Classic dacquoise are filled with whipped cream or ganache and stacked in layers. As they sit, the crisp interior melts to a decadently soft center. Divine! You won’t find a better frugal and fabulous bang for your buck than meringue. All it takes is egg whites and sugar. Save the yolks for other recipes. With meringue there are a few things you need to know. The bowl and beater must be completely free of fat. Use ⅛ teaspoon of cream of tartar for each egg white and you won’t risk overbeating them. Start slow and once begun, don’t stop. Cream of tartar is a wonderful thing. A byproduct of winemaking, the mild acid denatures some of the egg white proteins making the eggs froth up faster creating a stiffer, more stable meringue. If you don’t have any, substitute 1 teaspoon lemon juice or white vinegar for every ½ teaspoon of cream of tartar in the recipe. Preheat the oven to 225 F. Line two baking sheets with parchment paper. Draw four (7-inch) rounds on paper. Place the egg whites in the bowl of a stand mixer and beat on low until fine bubbles form. Add cream of tartar and gradually increase speed to medium-high, whipping until soft peaks form. Slowly add the sugar, one tablespoon at a time and whip until the meringue holds stiff peaks. Remove the bowl from the mixer. Using a wide spatula, gently fold in the nut flour, stopping as soon as it’s incorporated. Don’t overmix. Load the meringue into a piping bag with a large tip or a gallon-sized zip top baggie with the corner snipped off. Pipe in a spiral onto your parchment, forming discs. Bake the discs for 60 minutes then turn the oven off. Resist the urge to peek. Leave them in the oven to dry for at least four hours or better, overnight. To assemble: Whip the heavy cream with the sugar to soft peaks. Add the mascarpone, if using, and blend. The mascarpone adds thickness making it more stable. Layer the dacquoise with cream and sliced berries. Besides Valentine’s Day, remember this recipe for Mother’s Day and summer parties when the berries are perfectly ripe and in season. See you next week.